This section provides a broad overview of the layers of GeonBit. It’s arranged from top down, eg from the highest-level APIs to the lower-level “drivers”. A singleton class that reside directly under the GeonBit namespace, and provide the main API to initialize and run the GeonBit engine. Implement a GeonBitGame class and call GeonBitMain.Instance.Run() to execute it. Create your own MonoGame Game class, and call Initialize(), Update() and Draw() manually (less recommended method). A class that replace MonoGame’s Game class and integrates with GeonBit. You should inherit from this class to implement your game logic and use GeonBitMain.Run() to start the game main loop. Instead of the default MonoGame Content class, in GeonBit you use the Resources Manager. When implementing a custom component or GeonBitGame class, the resources manager is easily accessible via the Resources getter. The Managers layer is a collection of singleton classes, which provide API and utilities for things like input, game-time, diagnostics, physics, filesystem, etc. These classes are accessible by the game components and scripts you write. This layer contain a variety of UI elements you can create and use, and a main User Interface manager that runs the UI engine. 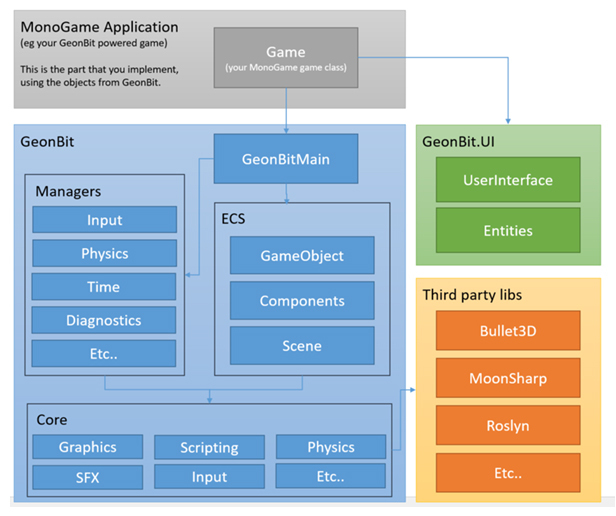 Note that GeonBit.UI is also released as an external independent library you can use for other MonoGame projects, even if they don’t use GeonBit. More details here. The namespace that contains all the Entity-Component-System related classes. The basic GameObject class is implemented in this layer, as well the GameScene and all the Components you can attach to objects. The Core layer provide the actual implementation of the different built-in components and engine components. For example, a component to render a 3D model will not deal with MonoGame models directly, but instead will use an object implemented in the Core layer that will do all the dirty work. The Core layer also implements the integration with some third-party libraries, like the Bullet3D Physics engine. While most of the Core classes are public and can be accessed by your game, usually its best to stick to the ECS layer and reduce Core usage to minumum. In addition to MonoGame, GeonBit uses some external libraries to implement different components of the engine, like Bullet3D for physics. These libs are used by the Core layer and you should not use them directly. Just know its there.